Background: Oxametacin is a non-steroidal anti-inflammatory drug with pharmacophores of classic histone deacetylase inhibitors. To evaluate the histone deacetylase enzymatic inhibition and antitumor potential of Oxametacin, molecular docking, molecular dynamic simulation and in vitro activity assay processes were performed in the present study. Methods: In the docking study, multiple π - π stacking and H-bond interactions were discovered to play significant roles in the Oxametacin-HDAC3 bindings. Results: Such interactions were proved to be stable by the molecular dynamic simulation. Enzymatic inhibition assay showed potent inhibitory activity of Oxametacin (IC50 value of 0.18 µM) against Hela cell nucleus extract compared with SAHA (0.21 µM). Conclusion: In the isoform selectivity assay, Oxametacin exhibited selectivity for HDAC3 (0.13 µM) over HDAC6 (0.46 µM). In the antiproliferative test, Oxametacin exhibited leukemic cell lines selectivity against the solid tumor cell lines. Current studies reveal that Oxametacin can be used as a lead compound in further development of histone deacetylase inhibitors for the anticancer therapy. 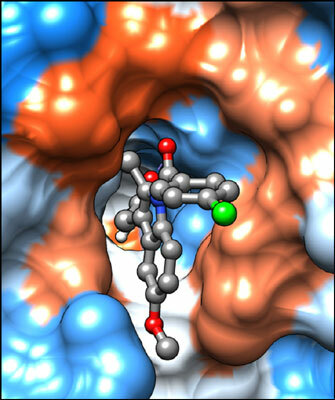 Keywords: HDACs, inhibitor, Oxametacin, hydroxamic acid, docking, molecular dynamic simulation. Keywords:HDACs, inhibitor, Oxametacin, hydroxamic acid, docking, molecular dynamic simulation. Abstract:Background: Oxametacin is a non-steroidal anti-inflammatory drug with pharmacophores of classic histone deacetylase inhibitors. To evaluate the histone deacetylase enzymatic inhibition and antitumor potential of Oxametacin, molecular docking, molecular dynamic simulation and in vitro activity assay processes were performed in the present study.